As part of the fusion of the Ill Tennis Club and the Strasbourg University Club, one contributed the parcel of land and the other the building. After an analysis of the existing spaces, the project proposed a mirrored extension and created a ‘backdrop’ to highlight outdoor spaces. As the high point of the composition, the new clubhouse and the envelope that stretches over it produces a symbolic junction that is both functional and visual. Pace and balance. 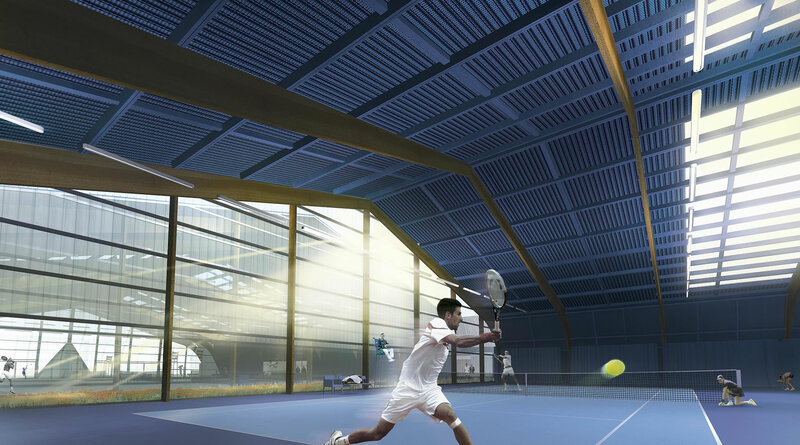 The existing hall fully meets the criteria of the FFT (French Tennis Federation). Never change a winning team! The extension therefore needed to optimize its features. This decision led to recreating the twin symbolism both in form and in function of the two buildings. To do so, it moved the clubhouse that was originally attached to the first building, to create a building behind it that opens onto the outside courts. Connecting the two large indoor courts, this new building rhythms the balance of the new ensemble in a dual movement of stretching and deepening the plane of the new facade. The compactness of the whole directs both human traffic and essential views from the space between the two buildings to the openings in the facade and in the interior walls. Materials. They reinforce the design. A light-coloured metal siding blends the halls into their environment. On the main section making up the clubhouse and the shared facade, the treated wood suggests the usability of the building (particularly its energy efficiency) as well as the living energy in the space.